Discussion in 'Announcements' started by Marindor, Aug 2, 2018. You're searching for the forgotten past of your ancestors, the Elvenar, and you decide to dig. And not just your average hole, no, you dig deep, and deeper, and deeper. And then, one day, you find something small. You dig a bit more, but what you found goes deeper than you had thought, and it's wider too! You dig further until you have fully uncovered what you believe was once a monument of some kind. It seems to have dried out the ground surrounding it completely, and there is pale, dusty desert sand everywhere you look. Your city is covered in it, and you see some Halflings scurrying away. You hear them whisper anxiously in hushed voices: they have seen this before. Once. It was shortly before their race got wiped away from the face of the world. The monument opens and now you know what the Halflings are so scared of. Creatures are appearing left and right, and it doesn't take long for you to understand what and who they are. You have uncovered a monument of the Amuni, which were believed to be long-gone. Well, it turns out the sources telling that story were wrong, because here they are, alive and well. The Amuni coming out of the monument are carrying some of the artifacts of their culture, which depict their cat-like god: Bastet. Your citizens are slightly afraid of what'll happen now: the Amuni have a bit of an attitude towards anything that's not theirs, there is this sense of superiority among them - especially when it comes to their culture. In that sense, they're a lot like the Elvenar were. When the Amuni spot you, and not the Elvenar, they are even more convinced of that: their culture has prevailed, whereas the Elvenar's seems to have gone. Dryness follows the Amuni everywhere they go, turning any place they show up in into piece of desert as their settlement drains the fertile land of water, making it inhospitable for other life forms. It looks like they're getting ready to settle in your city. Maybe that's not the worst thing, because the Amuni were a very developed people, but they may need to make some... adjustments to make things work for them. However, that should also allow your people to gain more knowledge, and improve the city's overall production. Will this be your fate? Can a combined effort of knowledge and trust between all different cultures of Elvenar convince the Amuni to learn how to live in harmony with nature? With the Amuni settling from today on, you will face new challenges in developing your city. You will need to acquire enough prestige to be able to place your settlement Buildings. 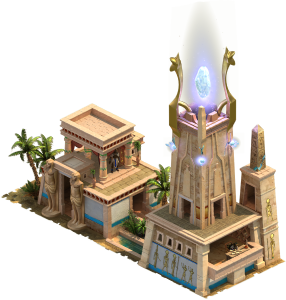 You can gain prestige by upgrading and boosting the Amuni's monument: the Temple of the Dunes. 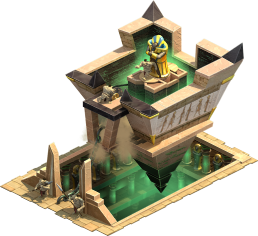 Prestige is required to build Goldsmiths and Trap Makers, which you will need to advance through the technologies of the Amuni. The Goldsmiths and the Trap Makers are unlike any other buildings you've seen from the guest races so far, since they will need to be connected to your existing Residences and Workshops respectively to be able to produce anything with them. With the discovery of the Amuni, your citizens will learn how to create three more types of Sentient Goods, namely Obsidian, Arcane Ink, and Royal Velvet, which you will need to upgrade their buildings and research technologies. Additionally, you will be able to place more City Expansions on the map, because we are increasing the size of the map to its maximum: with a new row added on the southwestern side of your city, it can now be 60x60 tiles big - provided you have the City Expansions available to place in this area, of course! From now on, you will be able to update all Ancient Wonders for another 5 levels, up to level 30. And, if you manage to help the Amuni, they will teach you about their own Ancient Wonders, which have some new, unique effects that will be of great benefit to your city. The Lighthouse of Good Neighborhood (pictured above on the left) increases the duration of the Ensorcelled Endowment spell and will increase the Mana production of buildings that have received Neighborly Help. The Pyramid of Purification produces Heavy Melee Units and will give you boosted Sentient Goods when picking up Orcs. The challenges the Amuni offer, give reason enough to thoroughly think about how to handle this new Guest Race as efficiently as possible! We wish you a lot of joy and good fortune in your challenges around handling the Amuni! Of course we're looking forward to hearing your feedback in our Feedback Thread! And if you want to know more about the Amuni, we welcome you to check out this wonderfur video with Timon, Rike, and a guest star you wouldn't want to miss! indigomage, Loki Blue, CiraKelley and 10 others like this. Just an extra addition: For the Amuni to be fully used to our mobile devices, we would need the app to be at version 1.60. At this moment the new Guest Race will not be fully functional on mobile yet. iDavis, Dawien, Isil Rilma and 1 other person like this.